Before you were here an hour I would die for you This is the miracle of life --Maureen Hawkins The relationship between a mother and daughter is like no other. A daughter reminds her mother of herself as a girl, offers her a chance to relive that girlhood, then passes her mother's wisdom on to her own daughter someday. Mothers and daughters know what the other is thinking before she says it, and communicate with a touch or a glance as easily as with words. A mother's love is so strong, sometimes words alone are insufficient to express it. That's why Becky Kelly's gift book, Dreams for My Daughter, is so special. On every page her soft watercolor illustrations celebrate the warmth of a mother's love for her daughter. 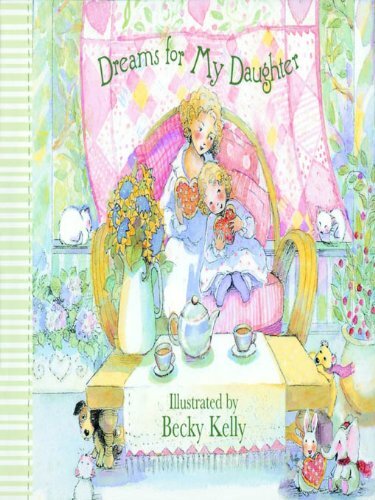 Paired with beautiful prose, each enchanting image evokes the heartfelt times that only mothers and daughters share. Whether as a birthday or graduation gift, or for no special occasion at all, Dreams for My Daughter is a beautiful keepsake of a mother's genuine love.